See these gorgeous wedding dresses in person! 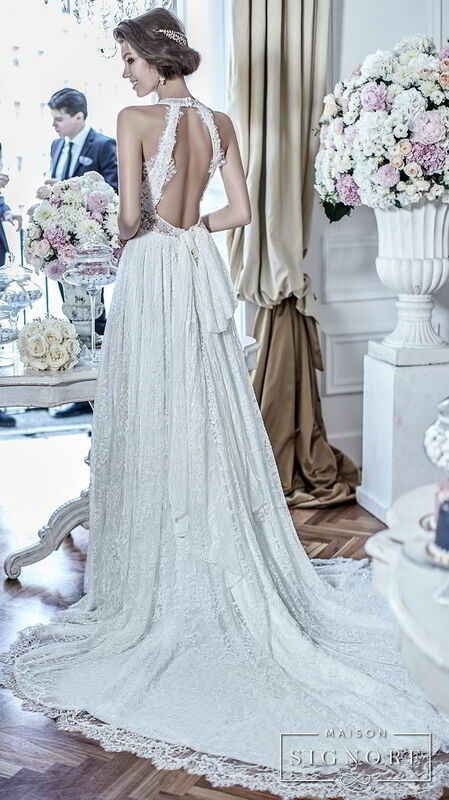 Drusilla gown from the Excellence collection. Love Maison Signore’s exquisite Italian-made wedding dresses? Then you don’t want to miss this amazing opportunity to view the gowns in person, and be the first to sneak a peek at the stunning designs from the atelier’s latest collections. 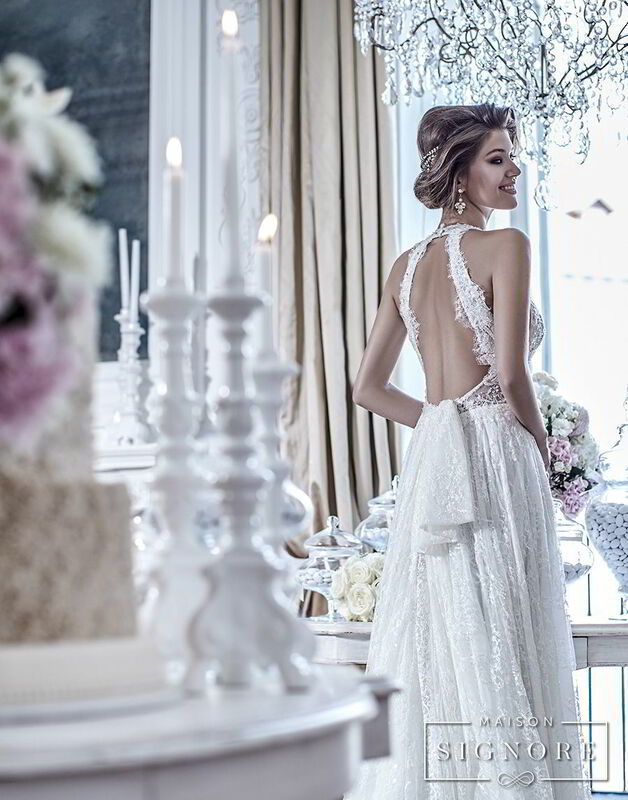 Mark your calendars: the Maison Signore trunk show will be held from June 14th to June 17th from 10 am to 6 pm at Kleinfeld Bridal in New York City and this is your chance to find the wedding dress of your dreams! What to expect? 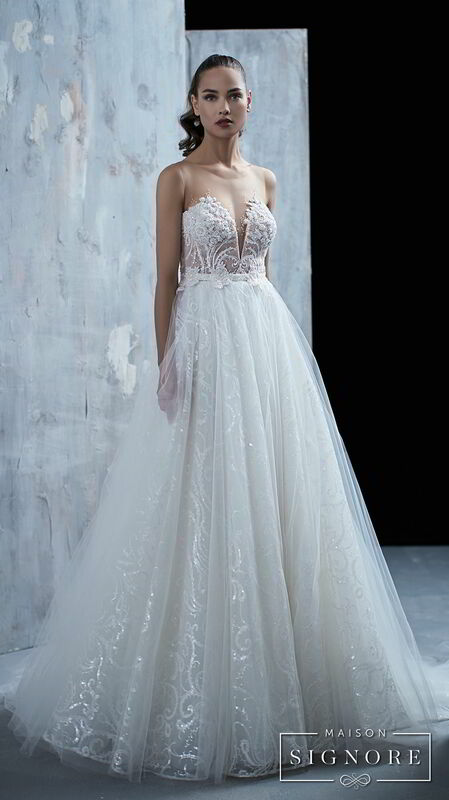 The ever popular gowns from the 2018 Excellence, Seduction and Victoria F. bridal lines, plus a preview of the 2019 collections, which are filled with gorgeous colors and ultra-romantic details and chic, modern silhouettes. 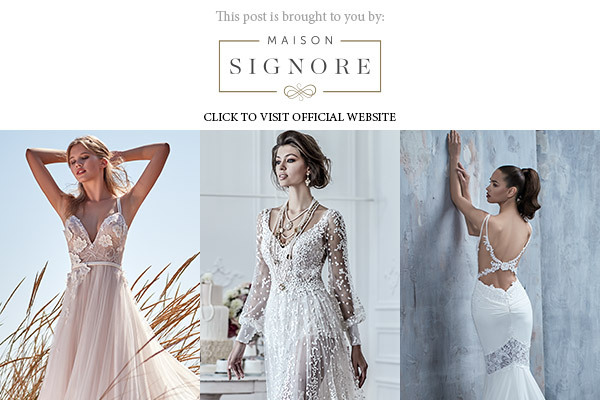 We’re bringing you some of the highlights from Maison Signore 2018 collections in this post, but the best way to truly appreciate the incredible details of these luxurious wedding dresses is in person. Visiting a trunk show is a great way to see and try on pieces from bridal collections that you love, plus you also get the chance to directly communicate with the talents involved in creating and customizing the gowns. Trunk shows are exclusive, by appointment only events and they fill up fast, so do register early if you have the chance! The details to note: the Maison Signore Trunk Show will be held from June 14th to June 17th 2018 from 10 am to 6 pm at Kleinfeld Bridal on 110 W 20th St, New York, NY. The Seduction collection is characterized by alluring transparency and intricate needlepoint embroideries, slits and backless details, and lavish crystals and rhinestones. This one’s made for the glamorous bride who loves a dramatic look! With an emphasis on luxury, timelessness and immaculate execution, the Excellence collection is perfect for the elegant, discerning bride. Featuring Italian embroidery, precious silks, pearls and gemstones, every single dress is a bejeweled work of art, designed to highlight the silhouette. Designed by Victoria Foraboschi, the Victoria F. collection is ethereal and romantic. Here you will find natural silks and trimmings, and delicate French laces on dresses that will mold the body with ease and grace. Romantic and bohemian brides, this one's for you! The Maison Signore Trunk Show will be held from June 14th to June 17th 2018 from 10 am to 6 pm at Kleinfeld on 110 W 20th St, New York, NY. Don't forget to book your appointment with Kleinfeld Bridal! Where to find a Maison Signore wedding dress or enquire for more details? Check out the retailers closest to you or email the company at [email protected] Want more beautiful bridal inspiration? Follow Maison Signore on Facebook, Youtube and Instagram.